2018 Bajaj Pulsar NS 160 is crafted on the same perimeter frame of the NS 200. However, the wheel size is quite less comparatively which could harm the riding quality. Well, the suspension setup comprising the similar conventional telescopic forks up front and monoshock at the rear. Handling, for which the Pulsar is recognized across the country, from the provided handlebar and riding position inspired by elder sibling NS 200, is up to the mark. One can easily manoeuvre the vehicle not only while highway speeding but also in traffic conditions. Beneath the fuel tank, the new 2018 Pulsar NS 160 Rear Disc is continued with the same 160 cc, single cylinder, oil cooled, 4 valve engine. The mill is rated to develop 15.5 PS power and transmitting 14.6 Nm of torque to the rear wheel via a mated five-speed gearbox. The Pulsar is one of the outstanding performers in the premium commuter segment. Not only in terms of cruising hard but also in terms of handling and braking the motorcycle is highly popular across the country. The new Pulsar NS 160 has been improved with in terms of braking with the introduction of a rear disc brake. Well, the ABS is not offered yet but expected to be provided soon. 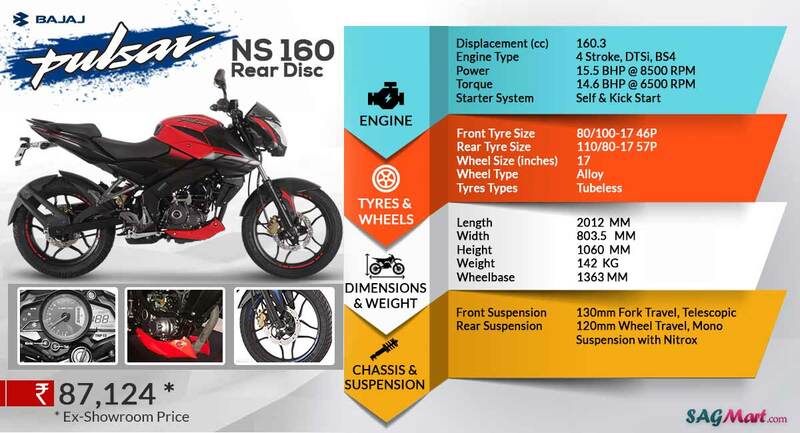 Priced at INR 1 lakh on road, Bangalore, the Pulsar 160 NS Rear Disc will take competition with the likes of Suzuki Gixxer, Yamaha FZ-S 2.0 and the Honda CB Hornet 160R in the segment. Also, the Pulsar NS has such charm among enthusiasts that it can easily undercut rivals and can give a tough competition.